Posted on April 3, 2018 April 3, 2018 Categories UncategorizedLeave a comment on The Cage-maker Nominated! Maybe it was my mother who made me give speeches on stages at Little Miss beauty pageants when I was young, but somehow I developed the gift of gab. I can get to talking and next thing you know, time has surely passed. So speaking to people and groups is a pleasure to me. In the past few weeks I have had the honor to speak in person or over FaceTime or Zoom to the Jackson, Miss Pulpwood Queens book club, the Southwest Louisiana Pulpwood Queens book club, the American Christian Fiction Writers North Georgia chapter, and the Friends of the Calhoun County Library in St. Matthews, SC. Connecting with readers is one of the joys of writing. Please contact me if you’d like to arrange a book club event or other speaking engagement. It would be my honor to discuss The Cage-maker or any of my other books. Nicole spoke with Erin Kienzle about The Cage-maker on WCIV’s Lowcountry Live this morning. It was short, but sweet! View the video here. Posted on September 6, 2017 Categories UncategorizedLeave a comment on Lowcountry Live! Goodreads Giveaway! 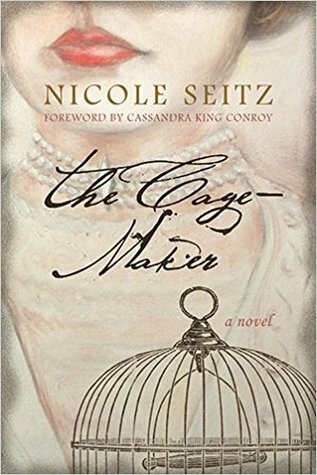 Aug. 13-31, enter to win a signed copy of my new novel, The Cage-maker! Good luck! Posted on August 12, 2017 August 14, 2017 Categories UncategorizedLeave a comment on Enter to win!